March 9th, 2012 Comments Off on Mmm. Raspberry Pi. 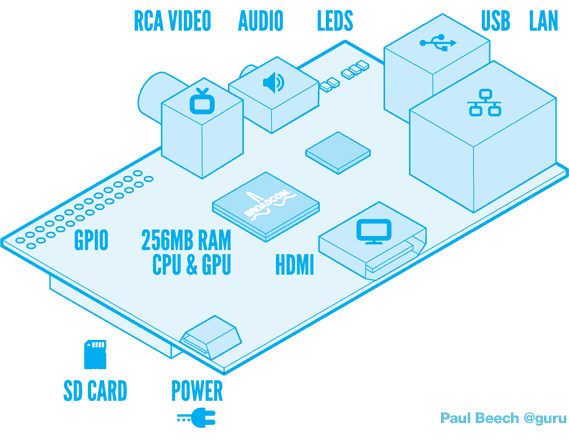 If you follow computing at all, you might be familiar with the Raspberry Pi project. It’s a simple ARM processor mini computer. That is a computer that can run Linux on a board the size of a credit card and is power efficient enough to run on battery, yet is powerful enough to stream full 1080p video or allow one to play high resolution 1st person shooter games. What’s my interest you might ask (after all, I am a software guy, not a hardware guy.) I have two reasons to be interested both related to the store. First, I think this compute platform may allow for a set of interactive displays in the store that previously were too expensive to contemplate on a capital and power anti herpes expense basis. Secondly, I believe there could be an infinite number of projects/kits that could be assembled centered on the Raspberry Pi computer that we can offer in the store. Back into the workshop later this morning after a week filled with paperwork. I love the tangible aspect of this project! You are currently reading Mmm. Raspberry Pi. at Oddyssea.